This salmon is rich and flavorful, requires only 4 ingredients, cooks in 10 minutes and its extremely healthy. Sounds like the perfect weeknight dinner to me. 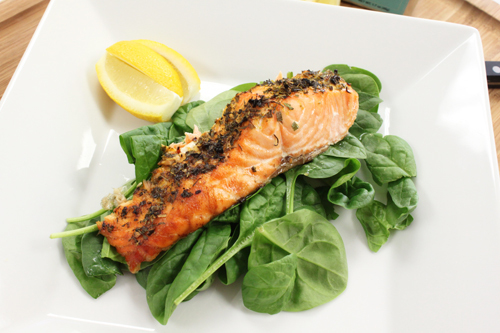 1 1/2 pounds salmon fillet 2 tablespoons Maine-ly Drizzle's Seafood Seasoning 2 tablespoons Maine-ly Drizzle's Extra Virgin Olive Oil of your choice, 1 lemon wedge salt to taste. Preheat broiler on high. Rinse the Salmon under cool water and pat dry with a paper towel. 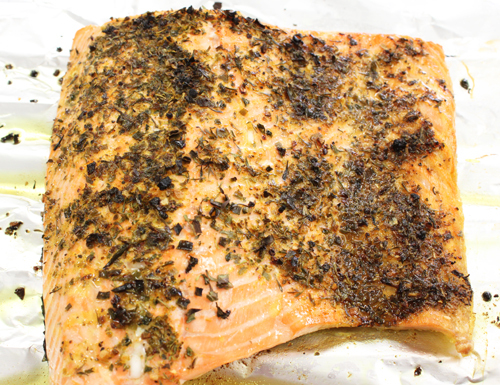 Place the salmon on a foil covered broiler pan or cookie sheet skin side down. Moisten the fish with the olive oil then coat it with the Seafood Seasoning. Broil, watching carefully for 10 minutes or longer for a thick fillet. Squeeze the lemon wedge on the Salmon before serving and add salt to taste. Serve with white or brown rice and a seasonal veggie.